For instances, the Ásana – Psycho-bio-physic positions that offer an exceptional physical, muscular, energetic, emotional and neurological resilience, characteristic of Yoga prepare the mental evolution and the passage of high energies, without any secondary effect. 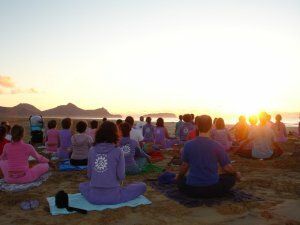 Yoganidrá – Techniques of Physical, Emotional and Mental Relaxation – allow a total relaxation and a rapid recovery from the physical effort in just a few minutes. Besides, it also enables the untying of neuro-psychic knots and the self resolution of unsuspected and impenetrable situations in the complex human psych. The Mudrá – Reflexologic and Energetic Hand Postures – explore the anthropological connection between the Hand and the Brain and stimulate the dialogue between hands and brain in a direct and profound manner. The Kryá – Organic Cleansing and Invigoration – along with a proper and careful diet , allow intense and complete processes of detoxification, originated in a unsuspected natural physiological human wisdom. The Mantra – Mastering of Sounds and Harmony – enable one to deal with powerful sound forces, whose properties are very strong. The Bandha – Muscular and Neuro-Endocrinal Dinamizations – act directly upon nervous plexus and endocrinal glandules extremely invigorating taking the practitioner to a state of constant youth but with a great control and wise conduct. The Yama/Nyama – the basis of the self-discipline found in the Primordial Yoga, with a Matriarchal root and fraternal bounds, helps to conduct the very high energies gathered and handled, preventing an upsetting and possible lesions, not only in the physical level. 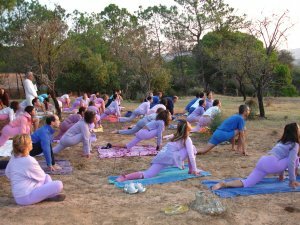 They also stimulate personal responsibility and anti-ego self work, maintaining clearly the purposes of Yoga and of the practitioner, without deviations. The Pránáyáma – Breathing Exercises of Neuro-Vegetative and Energetic Influence – allow exceptional energetic charges and the entrance in the Autonomous Nervous System and in the Neuro-vegetative functions, which in consequence brings the sensibility with the micro electro-nervous and electro-chemical currents and the Nádi (the lines mentioned in all the ethnic cultures of yellow skin, conducting energy from the Chakra [read Tchakra], its crossings and plexus, namely the 7 Main Chakra). In short, awakening, handling and conducting powerful body energies, namely the Kundalini, the Super Residual Energy of the DNA, that only millennia wisdom and the prudence of the Great Enlightened Masters of Yoga know how to handle. All of this constitutes the basis for stability and the core of Yoga's pyramid, of which Dhyána-Meditation is its bright summit. Without this, there is no true Meditation. Outside Yoga , there is no True Meditation. Meditation was the “Western” way of defining/”translating” Dhyána, because it was a concept inexistent in this side of the Globe. So, it was necessary to adapt a word already existent, but it was done incorrectly and inappropriately. To meditate meant to think in something deeply. But Dhyána is the opposite of using the concrete mind (the top for western thinking). Although the Yogi [read yö'gë] explores the concrete mind in the beginning, followed by the abstract and then the artistic ones, in an intense, brilliant and unique way, he/she puts it aside once it begins to be a gross obstacle, many times ruled by ego, and ascends to vaster Dimensions until it reaches the Supra Cognitive Area of the Mind , the most powerful one. Known as – Overmind, behond the Concret Mind. Each one of this Steps enables the efficient mastery of mind, reflected in the Control of the Frequency of Brain Waves in a way equivalent to the mounting of a stair, attaining enormous Height and Intensity, from the ordinary vigil state (ß – beta) to a (alfa) and then deeply to ? (teta) and superiorly to ? (delta). 3. Ajápa Jápa Dhyána and similar – Reserved (concentration in subtle but obvious organic functions). 5th. Step – Prathyáhára – the abstraction from the senses, a dive in the interior micro cosmos (and its fantastic wisdoms) until total abstraction of the surroundings is achieved (like the turtle plucking its body, turning inwards, discovering treasures). A test to this phase, that takes many years to achieve, consists in turning on a sound sorce (a radio, for instances) and its noise does not distracts the practitioner not even slightly. Then, near an airport, with planes taking off and landing, to be really indifferent to these noises (in Yoga, and in Evolution, there is no pretending, as it is harmful to cheat oneself). If so, this will be a total mastering of mind. Only then will the Practitioner be prepared to Dhyána – True Meditation. The Practitioner will then hold a beam of mind which will enable him to experience the Supra Consciousness and the Supra Cognitive Mind (Over Mind), plus all the Lucidity and Vision arising as a consequence. Up to now, the Practitioner explored the entire body, and he/she didn't confined the brain to the physical level, experiencing also the nervous, peripheral and autonomous system, and all the unused brain compartments, finding his/her better and brighter part. Finally, already as a Great Master (and Free), it will experience completely and totally the Nirbíja (without seed) Samádhi – the Ultimate Yoga Goal, the 9th Stage according to Patañjali, breaking the Wheel of Samsára, seeing behind Illusion (Máyá) the Reality of All Cosmic Wisdom (beyond appearance). The Practitioner will feel and know that the All is a part of himself/herself and that He/She is also Everything. The small, petty and ridiculous ego will at last be discarded and the Being will be entirely devoted to the Service of the Great Universal Cause, “Completing the Work”. All the other “meditations” from all the organizations of “meditation” outside Yoga will lead to nothing unless a serenity and well being – always welcomed in the society of stress, pollution and aggression to the Human Being and to Nature – but will only be but dry crumbles, dying flames of the Great Banquet of Wisdom and LIGHT , Power and Wisdom, that is inherent to it, and that, although not always promised to, it will always be denied to misinformed practitioners. (Over Mind) and the Consciousness and Vision that comes from it. the Path is essential, leading to the Supreme Consciousness. This approach by the Practitioner-Philosopher must be constant and clear, otherwise it will be a waist of time and a deviation from the Practitioner's first intents. Even more, the Practitioner will not be able to accomplish the Yoga's proposal of constant non theoretical Evolution in a single direction, with Concentration (and not Dispersion), and with means identical to the Great Ending, without exception.